It's been a little over eight years since Shankar and Rajinikanth's masterclass of cinematic insanity Enthiran created a small viral whirlwind with its over the top science fiction action and disregard for logic. The film made a buttload of money with its intended audience and found an extended life as a gonzo curio on the festival circuit after a nine minute clip of the climax surfaced on YouTube - dubbed in Russian, no less - several months later. Enthiran put its star, Superstar Rajinikanth, on the international radar in a small way and turned more than a few heads. After its massive financial success, a potential sequel seemed like a foregone conclusion, but it took quite some time for that to materialize. 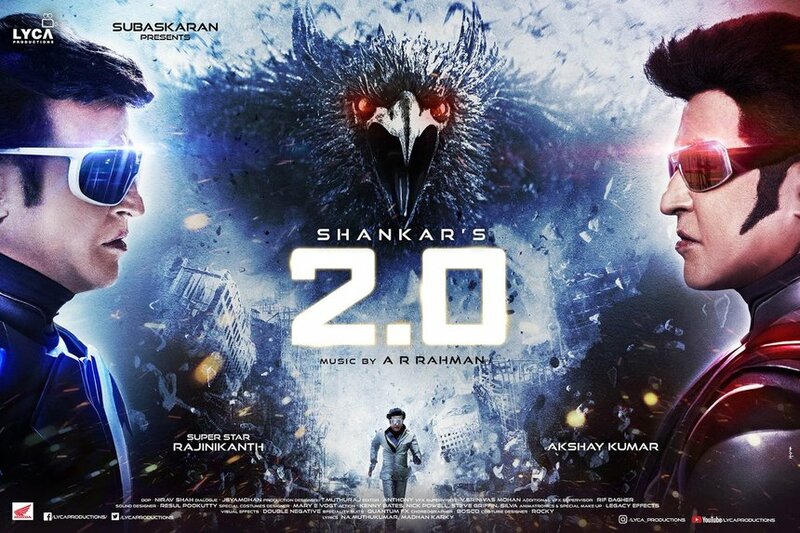 Stops and starts, extended post-production to shore up VFX, several announced-then-postponed release dates later, 2.0 is here, and while it most definitely delivers the goods in terms of off-the-chain action sequences, it also shows serious signs of fatigue from writer/director Shankar. The film picks up the story of Enthiran eight years later, the first film's human protagonist, Dr. Vaseegaran (Rajinikanth) is called in to help solve a sudden plague of cell phones taking flight from their owners hands and zipping off into the sky. In the beginning, the reason for these disappearances is unknown, however, the consequences are widespread as the smartphone addicted masses begin to revolt and panic. Dr. Vaseegaran, with the help of his robot assistant Nila (Amy Jackson), discovers that the mass mobile phone exodus is the work of a recently dead ornithologist (?) as a kind of vindictive retribution for the effects of cell phone towers on the sparrow population. My ears are smoking just trying to wrangle that sentence. The government of Tamil Nadu and Vaseegaran decide that the only way to battle this truly bizarre menace is to resurrect Chitti, the robot from the first film who was banished for developing emotions toward his master's fiancée. This leads to all kinds of new mayhem, lovingly rendered in state-of-the-art CG action sequences that would make Michael Bay weep with envy. Crash, boom, bang, the battle is won, the end. While it was the crazy action sequences in Enthiran that really put the film on the map and lead to its eventual popularity among gonzo cult film fans, there was a heart behind that bombast that filled in the quiet moments between explosions. With 2.0, that heart is all but extinguished in favor of, well, even more bombast, and pontificating about the plague of cell phone tower radiation. The only attempt at an emotional core is based in the backstory of our villain, Pakshi Rajan (Akshay Kumar), who just really loves birds. It's an odd choice, and the way it fills the running time is pretty absurd. The structure of the film is a huge mess. We spend over an hour not quite understanding what is going on or why, with the director expecting the audience to be pacified by the constant explosions and genuinely creative destruction wreaked on Chennai by a giant eagle made of flying cell phones (?). However, when we finally get a peek into Pakshi Rajan's motives, it takes the form of a 20 minute flashback that feels like it came out of a very different movie. It completely derails the film's inertia, and places the audiences sympathy squarely with the villain, to the point where I wonder why we're rooting against him the first place. Most importantly, though, it's completely unnecessary and is symptomatic of a really puzzling and exhausting trend in Tamil films these days. Over the last two decades, Tamil filmmakers have tackled high concept projects with increasing regularity. Enthiran was one such successful endeavor, but in the last few years, these projects have become obsessed with delivering social messages alongside their thrills. Almost every big budget Tamil action, thriller, science fiction, or horror film has been saddled with an obligatory moral that detracts from the pure joy of the cinematic experience. 2.0 is no different. Enthiran used a crazy science fiction concept to explore the idea of when love and whether or not it is ethical to create machines capable of emotion if we are going to punish them when they express it. 2.0, on the other hand, hangs its shingle on the very, very specific idea that cell phone towers hurt birds. Is this an issue that deserves exploration? Absolutely. Is it a strong enough concept to build a $75 million dollar major tentpole picture around? God no, and the film suffers for it. There is no room for performance or nuance in Shankar's film, every actor in the film is simply trying to stay out of the way of the special effects. Akshay Kumar's Pakshi Rajan is almost entirely VFX from start to finish, apart from the flashback where he is pretty much the only performer to express any attempt at emotion. Amy Jackson as Nila, the doctor's robotic sidekick, is, well, robotic in a way that seems like a huge step backward from Enthiran's portrayal of AI. But most disappointing is Rajinikanth's Vaseegaran, Rajini is the human embodiment of charisma, and yet here he is reduced to a punchline delivery system with zero emotional connection to anything or anyone. He plays three characters in the film, and each is less empathetic than the last, though through no fault of his, it's just embarrassingly flaccid writing and direction. However, I know that many will flock to the cinema to see the latest crazy Indian action sequences, and in that regard the film does definitely deliver, even if it does get mighty repetitive by the final reel. You'll definitely see things on screen that you've never seen before, and you'll see other things that are magnificent perversions of action tropes through Shankar's unique visual style. Buildings and cars get destroyed by the score, the flying cell phone motif is used to pretty creative ends and with solid results, and the extended finale sequence in which the main antagonists fight it out in a soccer stadium is filled with plenty of visual gags (many recycled from the first film to diminishing returns). In the end though, it just became exhausting without a reason to care about the carnage. There may not be a bigger non-Indian Rajinikanth fan on this planet than me. I worship the ground on which the man walks. I show up each new film, first day first show, anticipating ecstasy. I'm often willing to look past the rough edges, the poorly defined stories, and some of the bungled attempts at recreating a past glory. However, there is nothing more offensive to me than misusing this gem of a resource on screen. Rajinikanth is more than a star to build your VFX show reel around, no matter how good that show reel is. Rajini is an icon, an emotion, a feeling that deserves to be utilized respectfully, and 2.0 fails mightily in that regard. Are the VFX more realistic in 2.0 than in Enthiran? They definitely are, eight years of exponential progress is very apparent on screen. However, if it's in service of a lackluster story and blasé performances, who cares? I love these characters. I fell in love with them eight years ago the first time I saw Rajinikanth on the big screen, but this film lets them and us down. Even though the FX are inferior, I'll definitely find myself revisiting Enthiran one hundred times before ever feeling the need to go back to 2.0. It's a damn shame.